1. Soak the sabudana, in enough water to cover it, for about two hours. Drain off excess water. 2. Mix together sabudana, potatoes, peanuts, green chillies, coriander leaves, lemon juice and salt. Mix thoroughly. 3. Divide into lemon sized balls, flatten between palms of your hands. 4. Heat sufficient oil in a kadai and deep fry vadas in hot oil till golden brown. Drain on absorbent paper. 5. 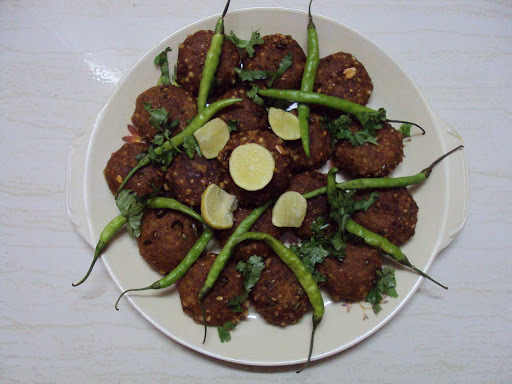 Garnish vadas with green chillies, coriander leaves and lemon slices. 6. Serve hot with chutney of your choice.